Wazir is ace filmmaker Vidhu Vinod Chopra’s project for decades now – He and Abhijat Joshi have been writing (and re-writing) the script since mid nineties – the time they got together to write ‘Kareeb’. As a producer, Chopra, over past three decades, has always ensured quality. From Jaane Bhi Do Yaaron, Parinda, 1942 – A love story, Munnabhai series, 3 Idiots to recent PK. The trailers had enough mystery about Wazir – ditto as Bejoy Nambiar has done in his debut and most notable venture Shaitaan – an absolute kickass of a movie. 2) Ab Tak BachchanWazir’s quality comes from the performances. Two minutes of Amitabh and one would forget the unforgettable 2015 ‘Bhaskor Da’ bowel act in ‘Piku’. His eyes and expression make you feel for his daughter, whom you hadn’t yet seen in movie till then. Witty, crafty and steady, Bachchan captures audience attention the most, like always! 3) Watch for Farhan, Aditi and Manav KaulIt’s refreshing to see Farhan Akhtar back as a lead after close to two years (since Shaadi Ke Side Effects). The luscious Aditi Rao Hydari (even without makeup) is very expressive with her eyes. I was keen on watching Wazir for the antagonist Manav Kaul (also in Kai Po Che, Citylights). He does well here despite limited scope. 4) Are you at edge of your seat? Not really.The movie is good in parts and loses steam frequently; when it’s left to the two protagonists to hold forte. The major culprit here is screenplay, needless songs and the Farhan-Aditi separation angle. The emotional drama makes the viewer restless and takes focus away from the original investigation. And the only song which sticks to your mind after the movie is 1968 classic from ‘Kismet’ – Aaao huzoor tumko..! Box Office Prediction: First day Singapore 9pm show (GV City Square) was 90% full. 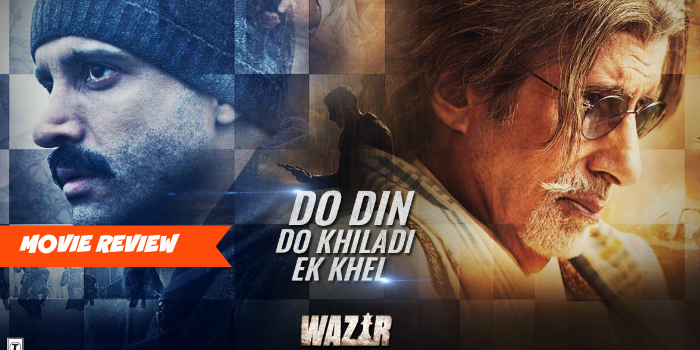 Reports suggest Wazir has 30 crores budget, box office may just about hit 50 crore mark – more due to star power of Wazir and lack of competition – till Airlift and Kya Kool Hai Hum 3 are released. Wazir is running multiple shows at Golden Village Cinemas, Cathay and Rex all over Singapore.